The Vicariate of Black Catholic Concerns (VBCC) is looking for applicants for this year’s Imani Nia Scholarship. The Imani Nia Scholarship is awarded to a graduating senior of African-American descent who attends high school within the Diocese of Brooklyn. The deadline is Friday, April 20. To apply, contact ImaniNiaScholarship@gmail.com for more details. New Youth Ministry Wants You! Calling all sixth, seventh and eighth graders. Meet new friends and learn more about your Catholic faith with the JP2 Youth Ministry at St. Columba, Marine Park. The youth group also meets every Thursday from 6-8 p.m. at Resurrection Church, Gerritsen Beach. For more information, visit www.jp2youth.org or like their page on Facebook (jp2youth). Contact youth minister Frank Morale: morale.ym@gmail.com. 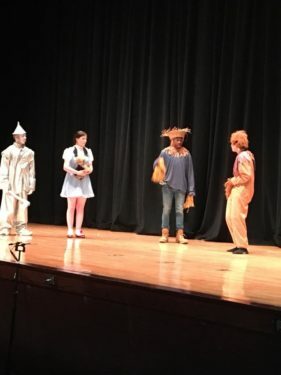 The Middle Village school’s Advanced Theater Arts class performed the play ‘The Wizard of Oz’ for the children from the school’s daycare and pre-k classes. The cast and crew of the production are: Kayla Barr, Gabriella Cama, Bryan Cordova, Lynn Drapala, Taylor Frost, James Lake, Robert Payamps, Nicholas Pellettiere, Krista Schuff, Satchel Bunch, Yoshua Gill, Amanda Mikol, Latrell Pugh, Patrick Remy, Peter Ross, Matthew Pezzulich, Kristie Caurauna and Gabriella Fusco.